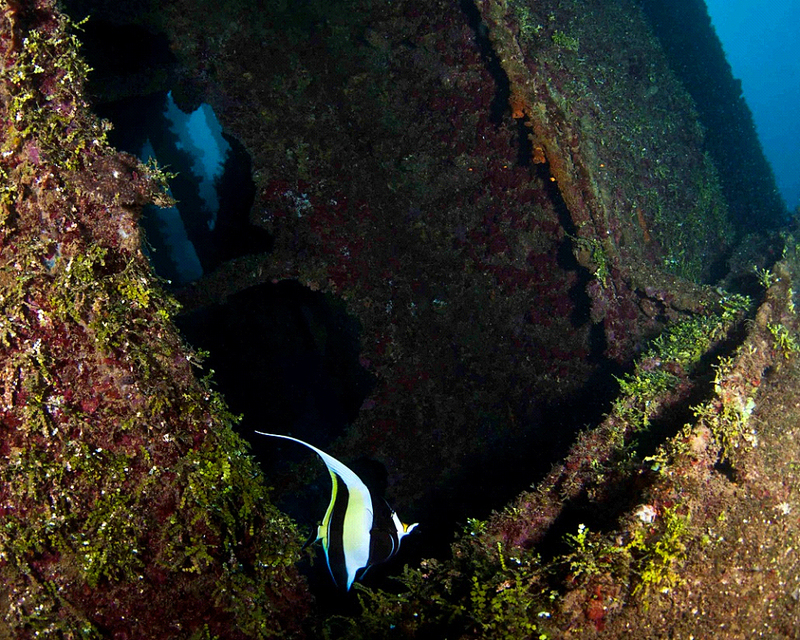 Guam’s Apra Harbor is home to a unique set of sunken warships. 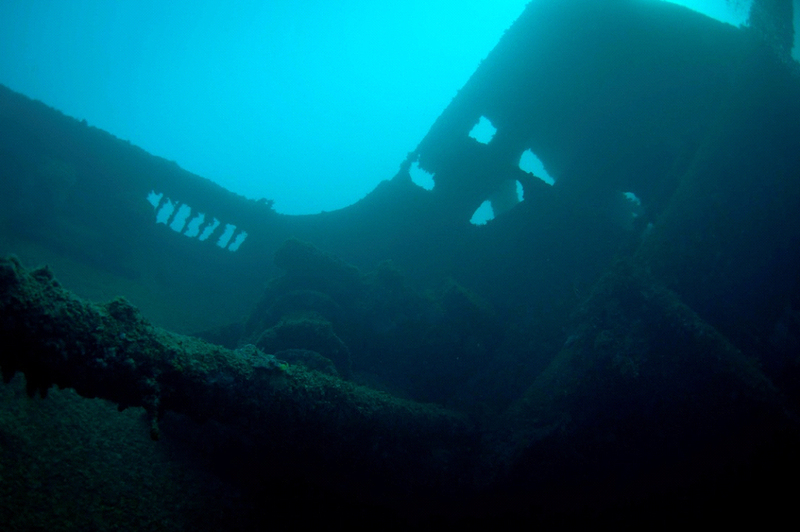 It is the only place in the world where a World War I and a World War II wreck sit touching each other underwater, and they can both be dived on one tank. 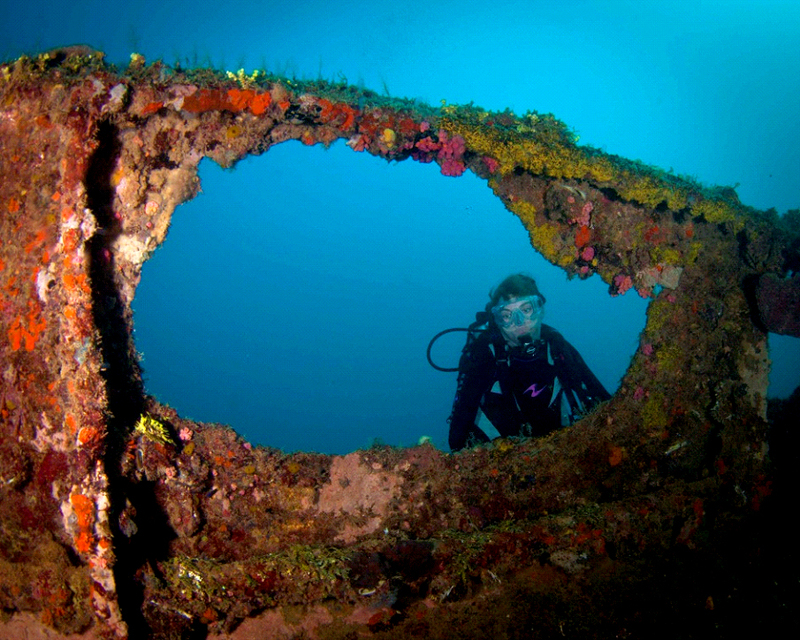 The calm, warm waters of Guam make for easy diving, and both wrecks can be mostly explored above 100ft. The story of how these ships sank is almost as interesting as the dive itself. German Captain Adalbert Zuckschwerdt steered his ship, the SMS Cormoran, into Guam’s Apra Harbor on 14 December 1914. With only 50 tons of coal left in the hold and not much food, he hoped the Americans of this U.S. territory would provide them with much needed supplies to continue their voyage. Although still a neutral party of WWI, the Americans refused to give an adequate amount of coal to continue their voyage, in part because of their own short supply, thus preventing the vessel from leaving Guam. The ship and her crew stayed in Guam peacefully for over two years, many moving onto land and living as neighbors among the indigenous Chamorros and Americans. The Cormoran started off as the Rjasan, built in a German shipyard in 1909. It was a 88-meter (290ft) passenger-cargo freighter built for Russia. During World War I, in August 1914, the Russian Rjasan was captured by the Germans off Korea by the SMS Emden. Converted to an auxiliary cruiser in the port of Tsingtao, Northern China, she was outfitted with guns salvaged from a disabled warship called the Cormoran, which had serious engine failures; she was renamed after that ship. Once refitted for war, the SMS Cormoran took to the Pacific where she spent all her time avoiding allied warships and Japanese battleships. Prior to reaching Guam she had not sunk any enemy ships. News reached Guam of America’s declaration of war on Germany on 7 April 1917, and in an attempt to prevent hostilities between the Germans living on Guam and keep the Guamanians from harm, the Americans asked Captain Zuckschwerdt to surrender. He agreed to surrender and asked if he could go to his ship to let his men know the news. Upon returning to his ship, he ordered the crew to scuttle the vessel. As the Americans saw this happening, they fired a warning shot across the bow of the Cormoran, the first shot fired by Americans in WWI. Ignoring this warning, the captain sent his ship and 13 crew to the bottom of the sea. These crew members are buried with full military honors in the Naval cemetery in Agana, Guam, and the rest of the crew were sent to Fort Douglas, Utah, for the duration of the war. This was the only hostile encounter between United States and German forces during the Pacific Ocean campaign of the war. Almost 25 years and another war later, Guam was invaded by Japan. In 1941, Japan occupied Guam—the only United States territory occupied by Japanese forces during WWII. The Tokai Maru was a ship built by the Osaka Shosen Company as a Japanese luxury liner in 1930. It traveled from Tokyo to New York and was 134 meters (440ft) long and 18 meters( 60ft) wide. In 1940, it was recommissioned as a freighter to transport personnel and war materials for the Japanese Imperial Navy. On 24 January 1943, the U.S. submarine Flying Fish spotted the Japanese Imperial Navy freighter Tokai Maru in Apra Harbor. The submarine waited just outside the harbor for three days for it to leave. Giving up on the waiting, the USS Flying Fish fired two torpedoes, one missing completely, running aground on a reef, and the other striking the Tokai, but not sinking her. Seven months later, on 27 August 1943, another U.S. submarine, the USS Snapper, was given another chance to finish the job the Flying Fish started. They fired four torpedoes, three hitting and sinking the Tokai Maru, the fourth hitting another injured Japanese vessel, the Nichiyo Maru. The Tokai Maru sank next to the Cormoran in Apra Harbor, with one small section touching each other. The Tokai rests in 36 meters (120ft) of water with an 85 degree list to her port. The upper forward bridge is the shallowest area starting around 12 meters (40ft). Most of the superstructure is still intact, and the engine room still has two engines with intact catwalks. Depth charges can still be seen in the stern, and the holds contain bed and truck frames. The Cormoran sits in 36 meters on her port side. Diving the wrecks Only a 10-minute boat ride from shore, both wrecks can be seen on one dive, but most dive shops, including Micronesian Diver Association (MDA) offers weekly two-tank boat trips allowing for two dives on these wrecks. With the mooring attached to the Tokai, most divers descend to the Tokai and continue across the ship to where it touches the Cormoran around 30 meters (100ft). 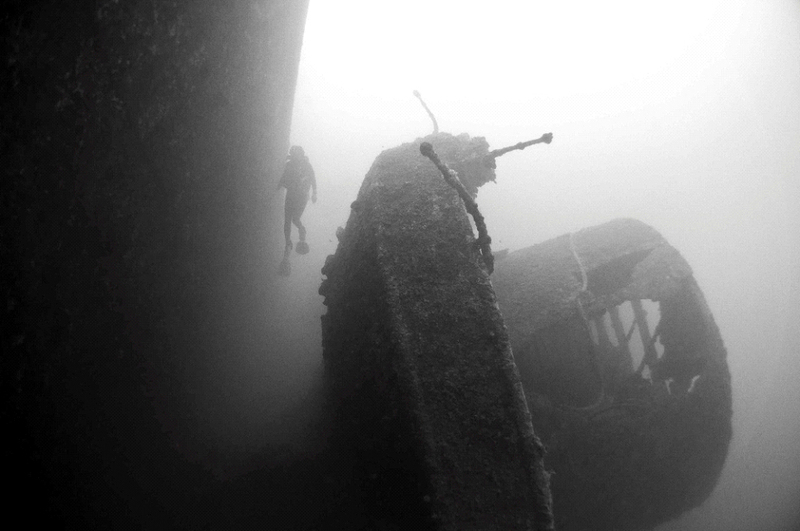 Then divers explore the Cormoran first, the majority of that ship being deep-er, during dive one. Often the second dive is used to explore the slightly shallower Tokai Maru. MDA does not lead dives, but for an extra cost will provide a guide. Unfortunately the location of these wrecks inside the harbor leads to varied visibility, usually 10-11 meters (35-40ft), depending on tide change and ship traffic in the harbor.